According to the National Sleep Foundation, nearly 50 million Americans suffer from sleep problems that can affect their careers, their personal relationships, and their safety. The effects of sleep loss are wide-ranging—studies have shown that a lack of sleep impacts the immune system, mood, memory, the ability to learn and process new information, and even weight. 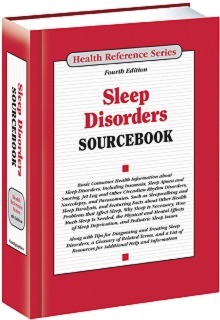 Sleep Disorders Sourcebook, 4th Edition, offers basic information about common sleep disorders and other health problems that affect sleep. It explains how much sleep is needed, the causes and consequences of sleep deprivation, and the methods used to prevent, diagnose, and treat sleep disorders. Pediatric sleep concerns are also discussed. Part I: Sleep Basics presents facts about why and how people sleep, including an explanation of circadian rhythms, the stages and physical characteristics of sleep, the benefits of napping, and what is known about dreaming. It discusses certain myths associated with sleep, and describes gender differences in sleep, and it explains how aging affects sleep patterns. Part II: The Causes and Consequences of Sleep Deprivation defines sleep deprivation and discusses its physical effects, including how loss of sleep can contribute to the of development physical disorders. It also describes the effects sleepiness has on memory, problem solving, learning, working, and driving. Part III: Sleep Disorders describes disorders that directly affect the ability to get a good night’s sleep. These include breathing disorders, such as sleep apnea and snoring, insomnia, circadian rhythm disorders, and parasomnias. It also discusses Kleine-Levin syndrome, periodic limb movement disorder, and restless leg syndrome. Narcolepsy and disorders associated with excessive sleeping are also discussed. Part IV: Other Health Problems That Often Affect Sleep provides information about disorders that often impact sleep quality, including Alzheimer’s disease, cancer, fibromyalgia, gastroesophageal reflux disease, Parkinson’s disease, respiratory disorders, and mental health concerns. The symptoms that disrupt sleep are described, and suggestions for lessening their impact are provided. Part V: Preventing, Diagnosing, and Treating Sleep Disorders identifies common sleep disruptors and explains the importance of a proper sleep environment. It describes how sleep studies work and details treatment options, including medications, dietary supplements, cognitive behavioral therapy, bright light therapy, continuous positive airway pressure and other devices, and surgery. Part VI: A Special Look at Pediatric Sleep Issues describes sleep disturbances in infancy, childhood, and adolescence. It discusses safe sleeping environments for infants and explains sudden infant death syndrome. It provides suggestions for getting children into bed and offers facts about bedwetting, sleepwalking, and teeth grinding. It also discusses problems associated with sleep deprivation in teenagers, especially school difficulties, drowsy driving, and mental health concerns. Part VII: Additional Help and Information includes a glossary of terms related to sleep and sleep disorders and a directory of resources for additional help and support. “The text is easy to read, enjoyable, and maintains definitive attention. Sleep Disorders Sourcebook has the capacity to reach multiple audiences because of its simplicity and reasonable presentation of essential information regarding the topic. Designed for undergraduates, high school students, and general non-specialists, this excellent book presents a current, balanced, and reliable collection of material.